For any­one donat­ing their in­come, be­ing aware of tax rules and mak­ing proper use of available de­duc­tions can re­sult in sig­nifi­cantly in­creased dona­tions. There are some ex­ist­ing re­sources on US tax rules (e.g. Ben Kuhn’s post), but I hadn’t come across any for UK tax rules yet. So in the hope of sav­ing some­one else (and fu­ture me!) some time, here’s my cur­rent un­der­stand­ing. If you’d like to share this with oth­ers, there’s a less EA-ori­ented ver­sion of this post on my per­sonal blog. All the calcu­la­tions and charts are in this spread­sheet. There’s also a per­sonal tax calcu­la­tor tab in the spread­sheet. Note: I’m not an ac­coun­tant, and I’m definitely not qual­ified to give tax ad­vice. Al­most ev­ery­thing here comes from the tax re­lief sec­tion on the gov.uk web­site. Be­fore mak­ing any de­ci­sions, check that what I’ve writ­ten is cor­rect and ap­plies to your situ­a­tion! If you spot any mis­takes, please let me know and I’ll do my best to cor­rect them. Tax thresh­olds and rates here are for 2018/​​2019. Scot­land has differ­ent rates. Some of the tax re­lief can go to your cho­sen char­ity au­to­mat­i­cally (i.e. ‘Gift Aid’). You might be el­i­gible for ex­tra tax re­lief, which you can claim back by ask­ing HMRC to re­duce your tax bill. Ex­tra tax re­lief can be sig­nifi­cant! Depend­ing on your tax rate, tax re­lief can give you a 1.25x-2.5x dona­tion mul­ti­plier. There’s some flex­i­bil­ity around which tax year you ac­count for dona­tions in. If you’re earn­ing less this year than last year you might be able to sig­nifi­cantly re­duce your tax bill this way! One key in­come bracket is £100-123.7k. If you’re in this bracket, you’re pay­ing an effec­tive marginal tax rate of 60%! So for ex­am­ple you could make a £20k dona­tion by giv­ing up only £8k. UK in­come tax is pro­gres­sive, i.e. in­creases with in­come. The chart be­low shows what to­tal in­come tax looks like for var­i­ous in­come lev­els, and how that breaks down into the var­i­ous bands. I’ve in­cluded data up to £200k since be­yond that it just goes up lin­early, and if you’re in that band you might con­sider in­vest­ing in proper tax ad­vice! In­ter­ac­tive ver­sion of this chart. If you earn less than £11.85k per year, you pay no tax. As you go fur­ther to the right from there, you always pay more tax over­all. The top line gen­er­ally gets steeper as you go right, but this isn’t true ev­ery­where. The steep­est part of the chart is be­tween £100k and £123.7k, where you grad­u­ally lose your per­sonal al­lowance. The steep­ness of that top line rep­re­sents your marginal tax rate—i.e. how much tax you’ll pay on ev­ery ex­tra £1 you earn at that level. This is a use­ful thing to look at, be­cause it af­fects the ‘dona­tion mul­ti­plier’ you’ll get at that level—i.e. how much your cho­sen char­ity will get for ev­ery £1 in net in­come you give up. When you earn be­low £11.85k, your dona­tion mul­ti­plier is x1. This makes sense, since there’s no tax to deduct. For ev­ery £1 you give to char­ity, you lose £1. When you earn £11.85k-£46.35k, your dona­tion mul­ti­plier is x1.25. In this bracket your tax de­duc­tion is fully taken care of by Gift Aid, so all you have to do is re­mem­ber to tick that box when you donate and the char­ity gets an ex­tra 25% di­rectly from the gov­ern­ment. In the bracket £46.35k-100k and again from £123.7k-£150k, your dona­tion mul­ti­plier is x1.67. 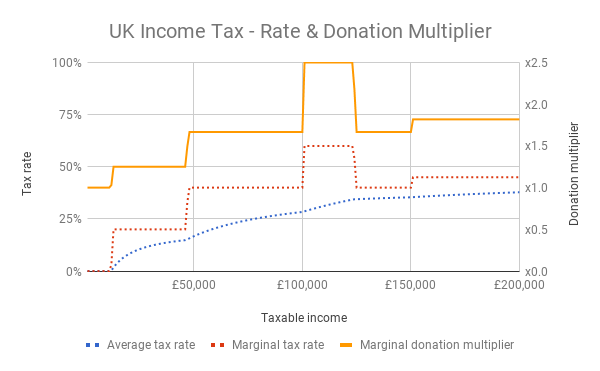 At this point the 25% in Gift Aid doesn’t fully cover your tax de­duc­tion, so you get to claim back some ex­tra tax from HMRC (see be­low for more on how to do this). At £100k-£123.7k, not only are you in the top 0.1% of global earn­ers, but you’ve hit the dona­tion mul­ti­plier sweet spot of x2.5. You can more than dou­ble your money with ev­ery dona­tion! 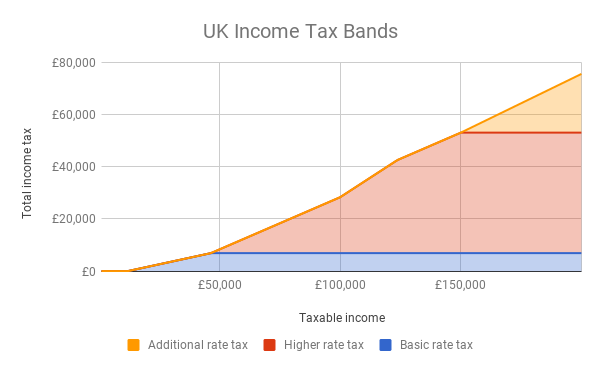 This is be­cause you’d be pay­ing 40% in tax while your per­sonal al­lowance would be re­duced by 50p for ev­ery £1 in­crease in your salary, re­sult­ing in an effec­tive 60% marginal tax rate. Again, you’ll get to claim back a lot of tax on any dona­tions. Beyond £150k—con­grats! You’re com­fortably in the top 0.1% of the global pop­u­la­tion, earn­ing al­most 150x the global av­er­age salary. Not only that, your dona­tion mul­ti­plier is x1.8, so you only give up 55p for ev­ery £1 you give to char­ity. And giv­ing to char­ity can raise your tax-free pen­sion al­lowance. If you’re a ba­sic rate tax­payer (i.e. your to­tal tax­able in­come is up to £46.35k) then you don’t need to worry about claiming tax back—Gift Aid takes care of it. Beyond that there are three op­tions I’m aware of: Pay­roll Giv­ing, do­ing a tax re­turn, or ask­ing HMRC to change your tax code. Pay­roll Giv­ing is great, but your em­ployer needs to be set up for it. If they are, then all you need to do is tell your em­ployer your in­tended monthly dona­tion. They’ll take it straight out of your gross salary and give it to your char­ity of choice, with­out any tax be­ing de­ducted. If you fill in a Self Assess­ment tax re­turn, there’s a sec­tion on char­i­ta­ble dona­tions. Do­ing one isn’t ex­actly fun, but it’s not as difficult as it sounds (and I’ve heard it’s much eas­ier than the US sys­tem!). All your em­ployer’s data will be im­ported already, so you only need to fill in ad­di­tional de­tails on your dona­tions and any other rele­vant sec­tions. If you’re do­ing reg­u­lar dona­tions then the next op­tion is prob­a­bly bet­ter for you, but if you want to be able to do things like op­ti­mis­ing the tax year of your dona­tions then you’ll need to fill in a Self Assess­ment tax re­turn. And if you earn over £100k you’ll have to do one any­way. you’re earn­ing a lot this year, but un­sure on where/​how much you want to donate. You could hold off on donat­ing un­til just be­fore you sub­mit your tax re­turn. you paid a higher marginal tax rate last year than you ex­pect to pay this year, so could in­crease your effec­tive dona­tion by sub­mit­ting it in last year’s tax re­turn. Why does this work? When you fill in a Self Assess­ment tax re­turn, you do that for the pre­vi­ous tax year (April-April). And you have un­til Jan­uary 31 in the fol­low­ing year to do this (i.e. al­most 10 months af­ter the end of the tax year). You’re al­lowed to ac­count for dona­tions made in the cur­rent year as if they hap­pened last year. Speci­fi­cally: “you can also claim tax re­lief on dona­tions you make in the cur­rent tax year (up to the date you send your re­turn) if you ei­ther: want tax re­lief sooner, or won’t pay higher rate tax in cur­rent year, but you did in the pre­vi­ous year”. Which char­i­ties will max­imise the im­pact of your dona­tions? Should you give now or give later? How much should you give right now? Hope­fully this post helps clar­ify the tax as­pects of that. You can find the spread­sheet be­hind each of the charts here (and 2017/​2018 ver­sion here), in­clud­ing a calcu­la­tor sheet for any given in­come/​dona­tion amount. Many peo­ple have signed the Giv­ing What We Can pledge to donate 10% or more of their in­come for the rest of their lives. Could you donate ap­pre­ci­ated as­sets (like prop­erty, shares, or bit­coin) in­stead of in­come? In this case you can get Gift Aid on both in­come tax and cap­i­tal gains tax. Some em­ploy­ers will match your dona­tions, dou­bling your dona­tions again with no ex­tra effort in­volved. If you don’t live in the UK, you’ll ob­vi­ously have to fol­low differ­ent rules. Ben Kuhn has a great post on giv­ing in the US. If you’re earn­ing a lot but aren’t sure where to give yet, con­sider set­ting up a donor ad­vised fund. Is earn­ing to give (i.e. max­imis­ing your in­come and re­sult­ing dona­tions) the most promis­ing ca­reer path for you? Are there other things you should be con­sid­er­ing if you want to max­imise your im­pact on the world? * In this post I’ve fo­cused on in­come tax. I haven’t taken into ac­count Na­tional In­surance pay­ments in any of the calcu­la­tions, as these aren’t de­ductible. I also haven’t mod­el­led the im­pact on other things like stu­dent loan re­pay­ments or pen­sion al­lowance in­creases. As for in­come tax, there are some limits to the amount you can claim back, but they’re quite high—“Your dona­tions will qual­ify as long as they’re not more than 4 times what you have paid in tax in that tax year”. Thanks Har­ald, this is a ter­rific ar­ti­cle and should be re­quired read­ing for all UK donors. I love the graphs in par­tic­u­lar and the con­tent looks ac­cu­rate to me. I think gift aid and tax re­lief are im­por­tant con­sid­er­a­tions which in­crease the benefit of giv­ing now rel­a­tive to giv­ing later- par­tic­u­larly for higher rate tax­pay­ers. In re­tire­ment, most peo­ple will have a sig­nifi­cantly lower in­come than dur­ing work­ing life, and very few peo­ple in­deed are likely to be higher rate tax­pay­ers in re­tire­ment and benefit for a 1.67 mul­ti­plier. There also seems to be lit­tle tax benefit to donat­ing to char­i­ties in your will - un­less you have a large es­tate be­yond the high thresh­old for in­her­i­tance tax (effec­tively 650,000 for mar­ried cou­ples) and pre­sum­ably there is no gift aid on be­quests ex­cept for any in­come tax you paid in your fi­nal year of life? Thanks for writ­ing this! The in­ter­ac­tion be­tween dona­tions and the re­duc­tions in per­sonal al­lowance are in­ter­est­ing, and I would not have thought of them oth­er­wise. This was a nice post. The tax laws changed in the US at the end of 2017 and I’m prepar­ing a post to sum­ma­rize the dona­tion-spe­cific changes. Found this when I was brows­ing past posts. I knew a lot of this be­fore donat­ing but I still lost some money. I’ll de­scribe how. I got my first UK job in Septem­ber 2015 for a com­pany that did not have pay­roll giv­ing scheme set up. I donated some money in Jan­uary 2016 and May 2016 and I let the char­ity claim gift aid (25%) in both cases. Since I was a 40% tax payer, I was el­i­gible to claim the differ­ence be­tween my tax rate and gift aid (40%-25%=15%) from the gov­ern­ment. How­ever, I was told that I could only claim this differ­ence for my May 2016 dona­tion be­cause I didn’t pay enough tax in the tax year that ended on April 2016. If you call tax hel­pline (https://​www.gov.uk/​gov­ern­ment/​or­gani­sa­tions/​hm-rev­enue-cus­toms/​con­tact/​in­come-tax-en­quiries-for-in­di­vi­d­u­als-pen­sion­ers-and-em­ploy­ees), they gen­er­ally can an­swer all the ques­tions about your situ­a­tion. I’d love to see the com­par­i­son in mul­ti­plier for donat­ing stock ver­sus cash in the UK. In the US our largest donors of­ten give in stock be­cause the donor avoids cap­i­tal gains tax AND can deduct the FMV (fair mar­ket value) of the stock. Would be valuable to see how that plays out in the UK for you larger donors. Thanks for that. As you men­tioned in your guide I only re­cently re­al­ised that as I sub­mit self asse­ment re­turn, I don’t need to donate by April 6 tax year end, but can do so be­fore I sub­mit the self asse­ment re­turn in fol­low­ing Jan­uary which gives me an ex­tra 9 months to work out how much I can donate.